The book presents the results of theoretical studies of the effects of uniform and radial electrostatic fields on the single-particle states of charge carriers in low-dimensional semiconductor structures: quantum films and cylindrical and spherical quantized layers. The investigations are conducted within the framework of the effective mass approximation. Depending on the geometrical parameters of the sample and the intensity of the external field, various quantum mechanical approximate approaches are used in the computations: the adiabatic approximation, perturbation theory, variation method, and semiclassical approximation. For all the problems considered, the final solutions are obtained in an explicit analytic form. The book is intended for specialists in the field of low-dimensional semiconductor physics. Usually, when writing such books, authors necessarily note that the purpose is “…to make academic research more available to a wider audience”. By “wider audience” for which this book can be of real interest, the author assumes senior students, undergraduates, graduate students and other young researchers in the field of physics of low-dimensional semiconductors. In accordance with it the selection, systematics and presentation of the material are made. 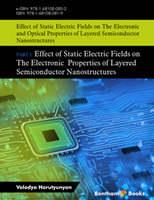 The book presents a theoretical approach to the problems associated with the influence of static electric fields on the state of charge carriers in the quantum wells of semiconductor layered structures with different symmetry. The quantized film, cylindrical nanotube and quantum dot-quantum well structure with spherical symmetry are considered in the capacity of test samples. The homogeneous and radially symmetric electrostatic fields are considered as an external influence on the sample. The relevance of considering such problems is undeniable, since along with the size quantization, the external static electric field is one of the powerful modulating factors affecting the states of quasi-particles in the sample. Presentation of the material assumes the reader is familiar with the basics of quantum mechanics and the modern theory of semiconductors. Given today’s opportunities in searching and finding the right information, we decided not to encumber the manuscript with multiple links but confine only to the extremely important ones. In addition, since the basis of the material presented are the scientific publications of the author, the reader can also find the corresponding necessary references in these articles. The purpose of our theoretical studies, from the methodical viewpoint, will be finding for the problems considered solutions in an explicit analytic form. The author will be grateful for comments and suggestions by the readers.